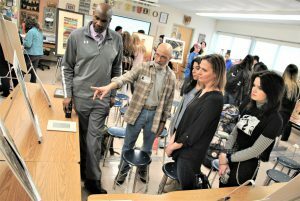 To complement a unit on multi-media collage for portfolio students, art teacher Kristen Spano hosted an exhibit of Laura Breitman’s work in her classroom on Friday, March 22. 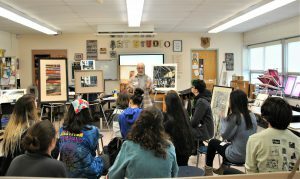 Michael Needleman, husband and fellow artist to the late Laura Breitman, introduced the students to the artist’s vision and technique. Painting? Collage? Photograph? Something of all three. Laura Breitman’s collage work starts with a photograph but slowly morphs into a vivid, 3D-like illusion, as she recreates the image with countless bits of fabric, laid down like layers of paint on a canvas. 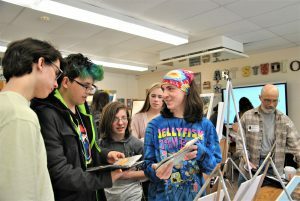 Senior Marie Cook was especially inspired by the artist’s treatment of light and shadows, and her extreme use of detail. “Looking at her work already changed my understanding of collage, and I’m changing my idea for my own collage project,” Marie said. 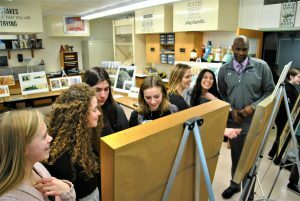 Michael Needleman generously donated Laura’s fabric collection to the art department and created a $1,000 art scholarship for a Warwick Valley senior pursuing a degree in the arts, in memory of his late wife, Laura Breitman.